Princess Elisabeth of Greece and Count Carl Theodor of Toerring-Jettenbach were married today in a Roman Catholic service in the chapel at Schlosss Seefeld, reports the Associated Press. The couple were married yesterday in a civil ceremony in Munich. 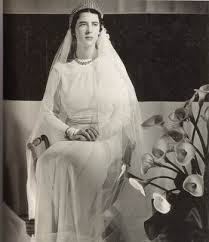 The bride is the daughter of Prince and Princess Nicholas of Greece and the groom is the son of the late Count Hans-Veit of Toerring-Jettenbach and his wife, Sophie, Duchess in Bavaria. Princess Elisabeth's mother was born Grand Duchess Helen Vladimirovna of Russia. The bride, 29, is said to be a "noted beauty," and related to "many royal families. Her older sister, Olga, is married to Prince Paul of Yugoslavia, a first cousin of King Alexander. Crown Prince Umberto of Italy, King George II of the Hellenes, Crown Princess Cecilie of Prussia and Crown Prince Rupprecht of Bavaria, were among the titled guests at the church wedding. The 32-year-old groom is a member of "one of the oldest and wealthiest" Bavarian noble families. The Count's mother, Sophie, is a sister of Queen Elisabeth of the Belgians.